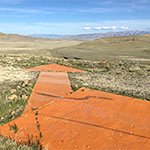 Dave Izatt has submitted some photos of the arrow at the site of San Francisco—Salt Lake Airway Beacon 57! 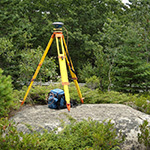 Submit your data and observations to help build and refine GEOID18! Airway beacon data is now available in GeoJSON format. 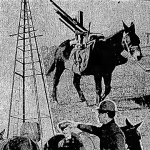 Dave DuPree has found an article from 1932 describing a new 36″ beacon being put in place on Red Butte mountain. Jack Fawcett has found a video showing what remains of Beacon #32. 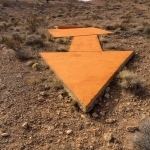 Art Young has visited the arrow associated with Los Angeles—Salt Lake Airway Beacon 31A near Glendale, Nevada! 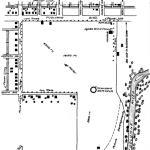 Gene Gomes has contributed diagrams of Hangar #1 and the former Bud Coffee Field in Modesto, CA! Harvey Hartman has an update on his “counterfeit” beacon! 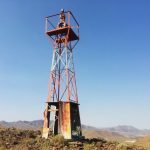 Ken Nussear has found an intact beacon tower near Fernley, Nevada. 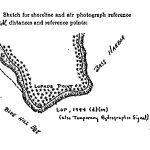 Pre-NGS Survey Data Sheets—Now with Images! 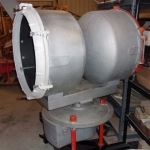 Harold Nelson of MaineDOT has sent along old horizontal control datasheets from Hancock County, Maine—they contain diagrams!